Place your eggs directly on the center rack in the oven. Place a baking sheet on the rack underneath (just in case an egg breaks). Carefully place cooked eggs in a large bowl of ice water. Let them cook for about 15 to 20 minutes before peeling. Put the mayo, mustard, celery salt and onion powder in a mixing bowl. Add to the bowl with the mayo mixture and carefully toss the potatoes to coat. Cut your cooked eggs in half (I used three eggs). Cut the egg halves into bite size pieces. Add the egg to the mixing bowl and sprinkle with coarse salt and pepper. Carefully mix together. Transfer to a serving bowl and sprinkle a little parsley (dried or fresh) over the top. 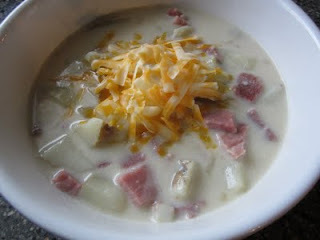 If you are looking for another way to use up leftover potatoes, or leftover ham, check out this post for Ham and Potato Soup, it's what's for dinner tomorrow night.